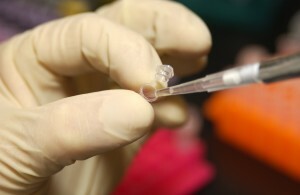 An individual may decide to pursue genetic testing as an adult for several reasons. While the most common reasons for adults to have genetic testing are to determine their carrier status or disease risk, there are many other benefits. * To aid in diagnosis of a chronic disease. A current medical condition may be caused by a previously unrecognized genetic defect, or the disease may have a genetic component. * To determine if a healthy (presymptomatic) individual will develop a disease, such as Alzheimer’s, later in life. Typically, an individual will seek this type of genetic testing if there is a family history of the disease. * To determine if the genome of an individual has certain alleles that indicate necessary lifestyle or environmental modifications. For example, the results of whole genome sequencing, or a genome wide association study (GWAS) may indicate a predisposition to type 2 diabetes. * To tailor disease treatment. The genetic background of an individual may help a physician determine the best course of treatment for a disease. For example, there are different versions of genes that control how quickly an individual metabolizes certain drugs. Multiple direct-to-consumer genetics companies offer genetic testing at a relatively affordable price. However, if an individual is considering genetic testing for medical reasons, it is best to have the testing performed, and then the results interpreted, by a healthcare professional.